In the spirit of onwards and upwards (and the fact that we are celebrating an AWESOME long weekend), I thought I would look at my goals for April and look at how I did for March. 1. Nutritionally prep for Boston A+ I have been very careful with this and outside of a weekend where I was travelling for work and there was a lot of wine and steak involved, I have kept things dialed in, stayed close to my race goals and met with my sports nutritionist this week to start planning my diet plan leading up to Boston. I have the added benefit of being able to discuss my strategies with my coach, Dave Galloway and one of my biggest running mentors and nutrition genius, Alex Genest. I have been tracking my macronutrients and I have never recovered faster from workouts or felt stronger in my life. I will be doing a post on some of my nutritional approaches closer to the race. 2. Introduce a few people to trail running. C I was looking forward to attending a 5 Peaks run, but unfortunately was not able to attend due to rescheduling but I have rounded up some friends who have never ran a race before to come out with me this summer. I am so excited! 3. Janji order for Boston – B So, I have picked out the outfit but it is so fresh that it is not online yet! I will do the big reveal of my race outfit when it is released and ordered. 4. Self care C – I tried on this one. But things like doing my nails, eyebrows and stopping to breatthhhhe fell by the wayside as I was in survival mode in March. So, I failed a bit but I clung steadily onto getting sleep so I am proud of that. 1. 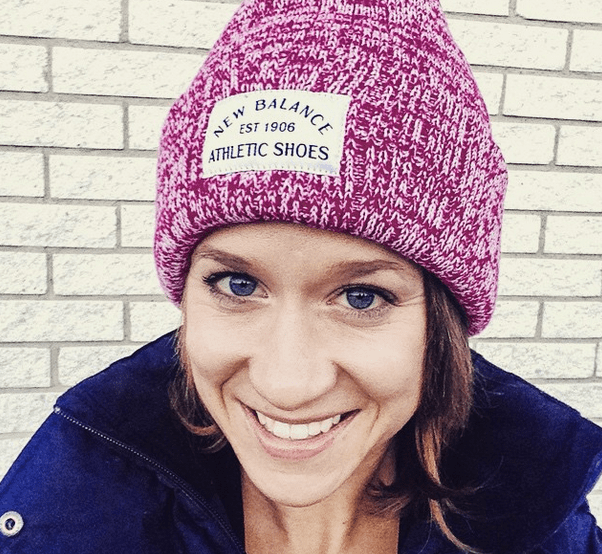 Run a smart and successful Boston Marathon – I am meeting with my coach in a couple weeks to discuss specific details to how I am conquering this race, but I am feeling strong and confident both mentally and physically. It is going to be such a special race. I’m also looking forward to meeting up with some of my sponsors for some pre and post race parties and meeting some of my blogger friends. Come faster, April 20, ok? 2. Do my first mountain bike race of the year. I have my little green racing machine prepped, fitted and ready for the season, now I just need to take her out and test it out! I am doing Paris 2 Ancaster less than a week after Boston so it will be more of a joy ride than a race, but it will be 40 KM of awesome! Sign up and join me! 3. Send out my newsletter. I don’t know if you have noticed, but I have added a new partnership! I am now running for New Balance and I am so excited to share some of their stuff with you. I did my research on this one, tried a few other companies and went with the one that worked the very best for me at the end of the day. All this to say, partnerships are one of my favourite ways to show you all how much I appreciate you reading my little old blog every week and my newsletter is a way for me to share exclusive discounts and gifts from my sponsors. April will be no exception, so if you want exclusive access to some deep discounts and gifts, sign up for the newsletter here! It will be sent out mid-April, right before Boston! 4. Go to my first 5 Peaks race. GUYS. I am so excited to launch this race series. I will not be running the first race because it is 5 days post-Boston, but I will be there in the CEP Compression booth and would love to chat! If you haven’t signed up for Terra Cotta yet, you can do so with the race discount, JESSICA. See you on the trails! 5. Sign up for a course. As a part of a really big personal goal, I am taking the first step and signing up for a course this summer. What is the biggest thing you are looking forward to in April? I won’t be running it but I will be there to cheer you on. You will ROCK it! I don’t know about you but the weather was pretty terrible in March for long runs as well. Fingers crossed you have an awesome April! Ohhh, I love 5Peaks races! My favourite is Golden Ears (out in BC, obviously) where the course takes us through a river and under a waterfall. I’m looking forward to hearing about your nutrition plan for the weeks leading up to Boston! I want to run Golden Ears! It sounds like a PERFECT trail race. I see some solid A’s up there!! I WANT A HAIRCUT..OK I need to do it already. Mine is at that awkward middle stage and my patience in non existent with it. Hair cuts are hard. I normally wait until it is so dire that I just chop it all off. Not recommended.